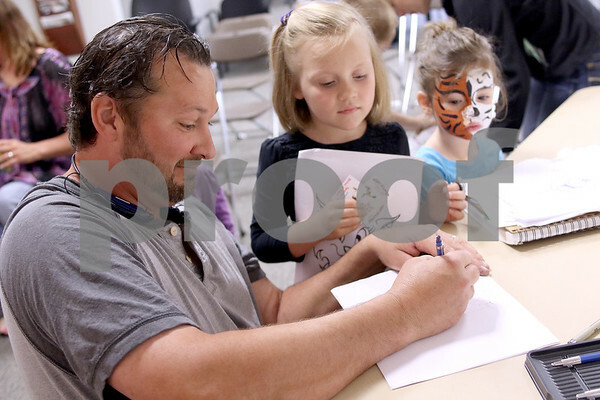 Author of "What is Love" Shane Smith works drawing an elephant as Vivianne Moyer (center), 5, and Eliana Gilson, 3, watch at the first annual Literacy on the Lawn family fun fest hosted by the Jerry L. Johns Literacy Clinic at the Northern Illinois University's Family Health, Wellness, and Literacy Center on Saturday, June 13, 2015. Children met with authors, played games, watched dancing by the Go Teachers! of Ecuador and listened to live music.